As you see, the tweet references a legitimate email, though it cuts off most of the major details—as in, who sent it, to whom, and (most importantly, in this case), when. 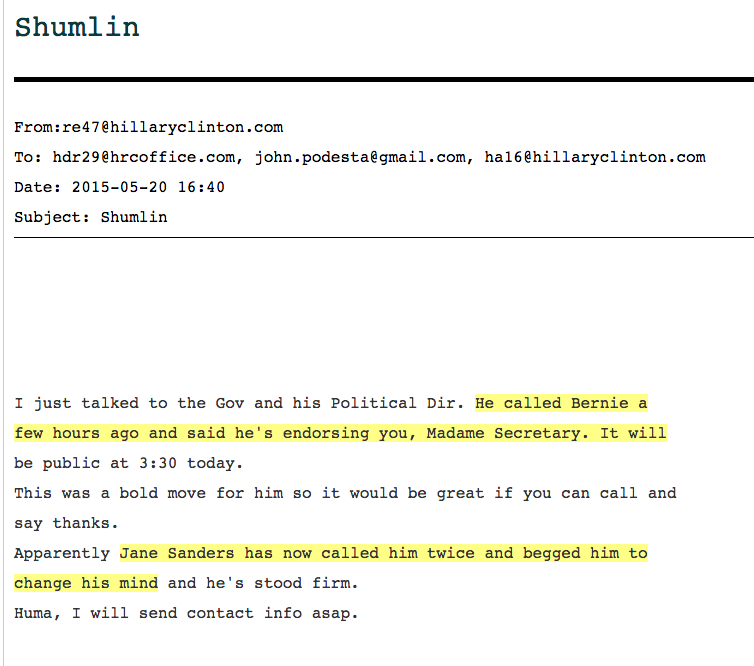 Without this information, it reads very much like Jane Sanders, wife of Democratic contender for the presidency Bernie Sanders, “begged” him not to endorse Hillary Clinton after he'd lost the primary. It's a juicy story, and it makes a kind of sense; there was plenty of mudslinging throughout that race, and it's easy to imagine some residual bitterness in the Sanders camp, particularly from someone as close to the candidate as his wife. There's a reason it was retweeted more than 2,000 times. 2. The email was sent on May 20, 2015, which is actually closer to the start of the primary, not the end. So that’s what we’re dealing with here—Jane Sanders called to chastise, not beg, Shumlin, who threw Clinton his endorsement at a time when it seemed specifically designed to hurt Sanders the most. At its core, this was a local political fight—not, as Twitter would have you believe, a desperate plea from Bernie Sanders’ wife to stop him from endorsing Hillary Clinton.